With so many votes cast, there were great showings for many of these movies. This just goes to show how successful DreamWorks Animation has been over the years — even their latest release, Madagascar 3, got a write-in vote. This Week’s Poll: In light of the release of Rock of Ages, let’s take a look at the filmography of Tom Cruise. Since he has had such a long and successful career, I am going to open up the voting for selecting the TWO best Tom Cruise movies. Lots of options with this one… what do you think will be selected #1? Hope you guys have had a great weekend, and happy Father’s Day to all of the great dads in the world! Very interesting result. This week I voted Top Gun and Last Samurai but MI4 is definitely close. A lot of good options there so I reckon this might be pretty close between quite a few. Very curious to see how well Top gun will do. I think the nostalgia factor will bring in some extra votes for Top Gun. Given the length of Cruise’s career, this may be the most difficult poll yet. Thanks for voting Pete! Hell YES to Dragon winning! I’m a fairly new fan to that film, but it totally and utterly won me over so bad when I watched it. Though… am I wrong in remembering, it came from one of the guys that brought us Lilo and Stitch? So there’s some Disney calibre in there. Voted for Top Gun and The Last Samurai as well. Two of my all time favourites from Mr. Cruise. So, guess I need to see How to Train Your Dragon, eh? I honestly wasn’t expecting that to win this poll so I suppose I should check it out. Told you the DRAGON would win!! heheh And I hate Mr Cruise… so it was a tough vote. Haha you called it, man. I’m not a huge fan of Cruise either, but damn if he hasn’t been in some good movies! I liked ‘Dragon’ from the first few minutes. Even without 3-D. ‘Toothless’ is going to be around for a long time. Nice! Glad to hear you’re a fan, Jack. All of these positive comments have made me bump it up in the queue. Man, this week is a tough poll. Crazy or not, the dude has done some good movies. Yep, you said it. As I put this poll together, I couldn’t believe how many genuinely great movies Cruise has been in. Lots of viable choices. Woah, I’m surprised Shrek didn’t win! In next poll I vote for Vanilla Sky. Just one vote this week? Glad to see some support for Vanilla Sky — I think that movie has an undeservedly bad rap. Woah, my brain is dying, totally overlooked ‘pick two’ 🙂 My second vote goes for Interview with the Vampire – love this movie and Cruise’s work as Lestat, despite the hard work of the producers to keep him as a vilain and horror cliched monster really shines, he completely captured his character. Haha no problem! I have actually never seen Interview with the Vampire. I’m going to have to check that one out. Wahoo!!! I LOVE it, it’s what I voted for. I mean Gerry Butler is one of the voice cast, so naturally 😀 Actually I love Chicken Run too, but I think HTTYD is one I’d watch over and over again, that Toothless is adorable! New poll: Collateral and A Few Good Men. Seems I’m the lone voter at the moment for Jerry Maguire (and I voted Rain Man as well). I loved Jerry Maguire when I saw it many years ago. I am overdue to revisit that one. Very glad HTTYD won by such a clear margin. I love that film. I actually voted for Curse of the Were Rabbit, which is a masterpiece…..actually if I had to choose between the two…….angsty brow has befallen me. I’m surprised W&G didn’t get more votes, actually. It seemed to have the best reviews out of any of these. Good picks! I just watched Collateral recently, and it was a lot of fun. It looks like it’s doing well in this poll, too. 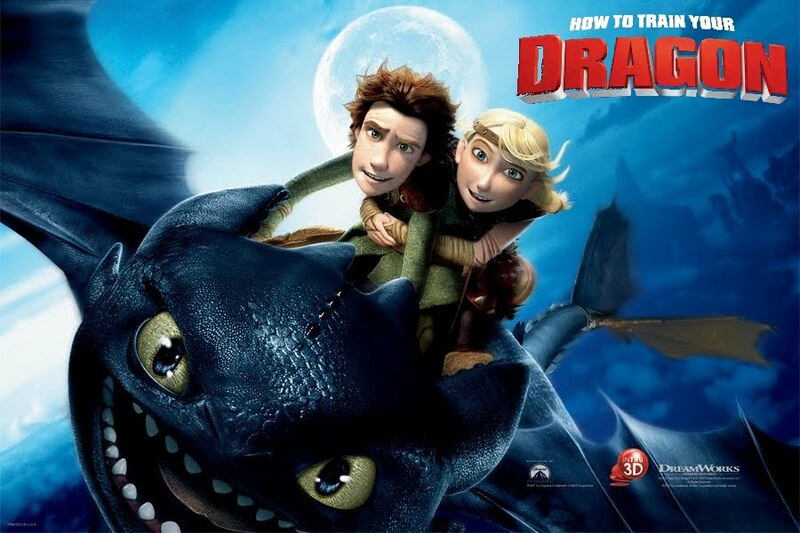 Httyd is THE best movie ever!!!!!!!!!! I didn’t vote, but go how to train your dragon!